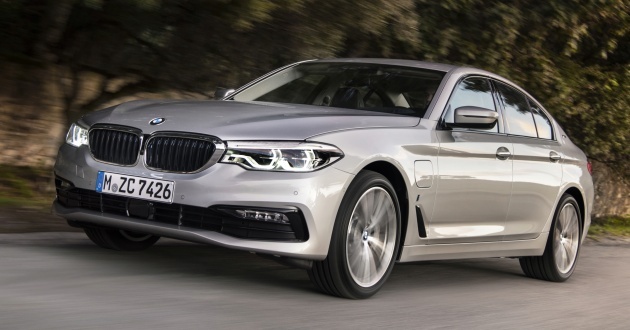 BMW has released more details and photos of the new G30 530e iPerformance, the latest addition to the German automaker’s plug-in hybrid portfolio that includes the X5 xDrive40e, 225xe, 330e, 740e, 740Le and the 740Le xDrive. The hybrid powertrain in the 530e consists of a 2.0 litre turbocharged four cylinder petrol engine providing 184 hp and 320 Nm of torque, along with a 95 hp/250 Nm electric motor that is positioned upstream from the transmission. This allows the torque (including in all-electric mode) to be manipulated by the eight-speed Steptronic gearbox, eliminating the need for a heavy torque converter. Supplying power to the electric motor is a 9.2 kWh high-voltage battery pack located underneath the rear seats, featuring a highly integrated low-temperature circuit and refrigerant cooling. According to BMW, recharging the batteries fully will take close to five hours using standard domestic power socket and in under three hours if it is plugged into a BMW i Wallbox. With an overall system output of 252 hp and 420 Nm, the rear-wheel drive 530e will make the century sprint (0-100 km/h) in just 6.2 seconds, and continue on to a top speed of 235 km/h. BMW is claiming a range of nearly 644 km in real-world driving when running as a hybrid, and up to 47 km when running on purely electric power. In the latter, the top speed is reduced to just 140 km/h. The 530e also comes with three powertrain modes that are selectable via the eDrive button located just to the left of the gear selector. The first – Auto eDrive – brings both the internal combustion engine (ICE) and electric motor into play like any hybrid, while allowing for all-electric travel at speed of up to 90 km/h. With Max eDrive, the ICE is removed from the equation altogether, with the car running on electricity only until it runs out of juice or if the accelerator is fully depressed. In this mode, the maximum electric top speed of 140 km/h is also made available to the driver. Finally, Battery Control allows one to set the charge level (between 30% and 100%) for the battery, with the electric motor acting as a generator to maintain the set figure so it may be used for all-electric driving at a later point. On the exterior, the 530e is identified by the several distinct cues, including the bue kidney grille slats, blue wheel hub covers, the charging socket on the driver’s side behind the front wheel arch, the “eDrive” emblems on the C-pillars and the “530e” badge at the back. On the interior, there are illuminated door sill panels with “eDrive” lettering, the aforementioned eDrive button, and special displays for both the instrument cluster and the 10.25-inch central information screen. Said display is also linked to the latest-generation BMW iDrive system and iDrive controller. As a side note, the position of the battery pack allows for up to 410 litres of boot capacity and a flat load compartment floor. BMW Connected is also available on the 530e, allowing owners to integrate their digital life through various devices. The system also includes Surround View and 3D View, which can be accessed via a smartphone using Remote 3D View. If you need more features, BMW Connected Onboard meanwhile, allows personalised information such as the next navigation destination, estimated arrival time and current weather conditions at the destination to be shown on the car’s display. Shifting to driver assistance and safety systems, the 530e comes with Evasion Aid and Crossing Traffic Warning, Lane Change Assistant and Lane Keeping Assistant with active side collision protection. Optional features include Active Cruise Control (ACC) and a further improved Lane Keeping Assistant that relays information from the Speed Limit Assist. Anyone wanna guess how much this will be when it arrives here? The X5 came in at 388k while the 330e retailed at 240k so this will be at the magical 300k border? ..Whilst all car manufacturers are moving to either Hybrid or pure EV, we in Malaysia tak tentu arah. Both Perodua and Proton have no clue about EV or Hybrid. You think RnD is cheap? Anyway, let us assume they do sell the 530e at RM300k. My advice to people is, wait for this car. Don’t buy any 520i or 528i or 520d yet. See what happened to the X5 buyers. Those who bought at RM588k all crying when BMW Malaysia introduced the X5 Hybrid EV at RM388k. The same with the 330e. 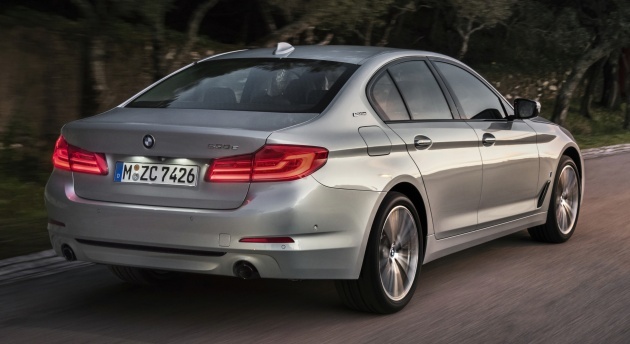 Now, the 320i and the 328i also difficult to sell. Until BMW Malaysia selling brand new 2016 320i at RM170k lelong price. New 320i is RM249k. E200 and E250 Mercedes buyers, becareful. There are people who do not want a hybrid in spite of the lower buying and running cost. Having a huge battery in the car is a concern and the RV is also affected by the replacement cost of the battery. More people will buy a 5 year old non hybrid than hybrid vehicle. Glad that they’ve found space to locate the battery pack under the rear seats. Hope that means boot space does not get reduced compared to the normal G30. This 530e can sprint to 100kmh in 6.2 sec. That is Hot Hatch territory. BMW is claiming a range of nearly 644 km in real-world driving when running as a hybrid. This is Tesla territory. BMW also claim recharging the batteries fully will take close to 5 hours using standard domestic power socket. This is easily done when U charge it when U go to sleep. Lastly, this G30 also includes Surround View & 3D View, which can be accessed via a smartphone using Remote 3D View. That’s will take care of those looking for high tech gizmos. This guy just doesn’t understand. ..
What? BMW is cannot beat tesla nuff said. You must be driving a faster car. Do you mind sharing what car you drive ! True, that new E Class is in its class of its own! I get about 600km on full tank with my Subaru XV 2.0 Liter engine. That’s with Ron 95. Only when I drive on the highway like a turtle. Just for the twin tail pipes included even in the base models the G30 is already a worthy upgrade from the F10. What are the economics between charging the car using an ordinary home socket for 5 hours to travel 47km and just filling it up with Ron 95? Can anyone share the math?